When individuals tell you that they were sexually abused or raped, often those victims are terrified, full of shame, and sure that you are going to think less of them. However, they have also given you great honor and privilege because they have decided that you may be a safe person in their most unsafe place. 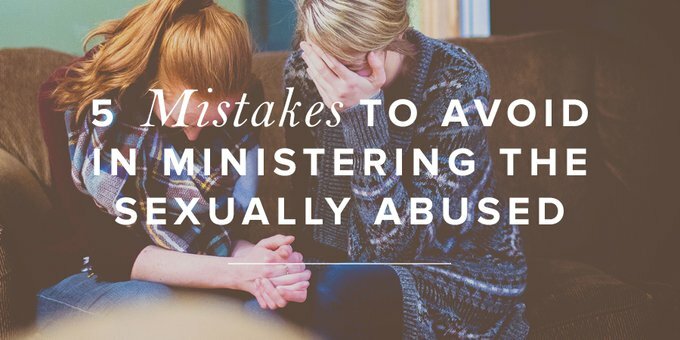 But ministering to men and women who are victims of sexual abuse can be tricky; there are several common mistakes that people in the Church make. By being aware of these pitfalls, you can be better prepared the next time an incident arises within your church. First and foremost, we need to recognize the experience of victims of sexual abuse and recognize their courage in sharing about their experiences. To do so, we should be gathering information. What do they mean by “sexual abuse”? Was it one time or ongoing? For adults who share that they were sexually abused as a child, it may be that over the course of a decade or more, they were victims of that abuse. Or it may have been a one-time occurrence. In gathering information, we are understanding the weight of what they have been through and can be better prepared to minister to them. Many times we make the assumption that because sexual abuse happened when someone was a child, it no longer happens to that person as an adult, or we assume that it will never happen again. But these are wrong assumptions. Just because people are “adults,” that doesn’t mean they are safe where they are. In seeking to minister to someone, you should be asking questions about their current safety, such as, “Are you safe where you are now, and if not, can I help you find a safe place?” You should ask these questions regardless of their age. As an example, a twenty-year-old may share that an uncle used to abuse her, and now he is coming to visit for the weekend. That should be a red flag for us; it may be that this young woman does not have the strength to keep the abuse from happening again. Because of this, we may need to find a place for her to stay, or we may need to call the police to help keep her safe. We cannot assume that abuse has ended or that she is strong enough to keep it from happening again. A third mistake that Christians may make is underreacting to hearing about sexual abuse. This presents itself primarily in two ways. First, a pastor, ministry leader, or church may fail to report the abuse. By law in all fifty states, we are required to report the abuse of a minor. It is a felony to fail to report any instance of child abuse that we hear about. Sometimes this is passed off as wanting to gather more information. However, we are not forensic investigators. Even with forty years of experience in counseling the sexually abused, I’m still not the expert in that area. Our duty is to report and to let the forensic investigators take it from there. The other way that Christian leaders and churches frequently underreact is that they try to cover up the abuse. Perhaps the accused abuser is a church member or a friend. I have seen churches try to cover up for those accused, either to protect their reputation or out of pure disbelief. However, covering up abuse is a felony as well. A fourth common mistake pastors, Christian leaders, and churches make when ministering to victims of sexual abuse is simply failing to be the Church to them. The role of the Church is to care for the brokenhearted, to listen well, bear witness, and walk alongside them. But sometimes I see churches fail in these things. It is also the role of the Church to demonstrate healthy relationships, which may mean engaging mentors or people who can model what it means to love one another properly. As an example, when I work with a woman who has experienced a severe trauma like sexual abuse, it may be that she’s never known what a safe or healthy relationship looks like. With her permission, I have oftentimes had women close to her come meet with me. I give them resources to read, and I talk about what it might look like to be helpful to the victim on a practical, day-to-day level. This may mean having dinner in their homes and seeing how family members are supposed to treat one another. Or it may be demonstrating how to show respect to one’s spouse. There are all sorts of things that a victim of sexual abuse, especially ongoing abuse, may have never been exposed to that church members close to them can help with. Now when Job’s three friends heard of all this evil that had come upon him, they came each from his own place. . . . They made an appointment together to come to show him sympathy and comfort him. And when they saw him from a distance, they did not recognize him. And they raised their voices and wept, and they tore their robes and sprinkled dust on their heads toward heaven. And they sat with him on the ground seven days and seven nights, and no one spoke a word to him, for they saw that his suffering was very great (vv. 11–13). We need to be like these friends, weeping and crying out to the Lord on their behalf. As pastors, Christian leaders, and churches seek to minister to victims of sexual abuse, they should recognize the gravity of what is being shared with them. In doing so, they can walk alongside them and lament with the victims. While that may also mean reporting cases of abuse, as required by law, supporting victims of sexual abuse demonstrates Christlike love toward them and ultimately leads to their healing. This post is republished with permission from Dr. Langberg’s website. Dr. Diane Langberg is globally recognized for her 45 years of clinical work with trauma victims. She has trained caregivers on six continents in responding to trauma and to the abuse of power. She also directs her own counseling practice in Jenkintown, PA, Diane Langberg, Ph.D. & Associates, which includes fifteen therapists with multiple specialties. Among Dr. Langberg’s books are Counsel for Pastors’ Wives, Counseling Survivors of Sexual Abuse, On the Threshold of Hope (with accompanying workbook), In Our Lives First: Meditations for Counselors and Suffering the Heart of God: How Trauma Destroys and Christ Restores. Dr. Langberg is co-leader of the Global Trauma Recovery Institute housed at Biblical Theological Seminary. She is on the board of G.R.A.C.E. (Godly Reponse to Abuse in a Christian Environment). She serves as Co-Chair for American Bible Society’s Trauma Advisory Council. Dr. Langberg is the recipient of the Distinguished Alumna Achievements from Taylor University., the American Association of Christian Counselors Caregiver Award, The Distinguished President’s award, and the Philadelphia Council of Clergy’s Christian Service Award. She is married and has two sons and four grandchildren.